NOW AVAILABLE: Post-doctoral and graduate student positions. Provide the research experience necessary to develop the next generation of leaders in stewardship science in the area of low-energy nuclear science in support of the workforce and research needs relevant to the NNSA mission. Stay updated on CENTAUR’s latest research advancements by following our Twitter account here. Workshop Announcement: SCIENCE WITH THE SUPER-ENGE SPLIT-POLE SPECTROGRAPH AND WORKSHOP ON TRANSFER REACTIONS, at Florida State University, Tallahassee, FL from March 22 – 23, 2019. For more information, click here. NEW! 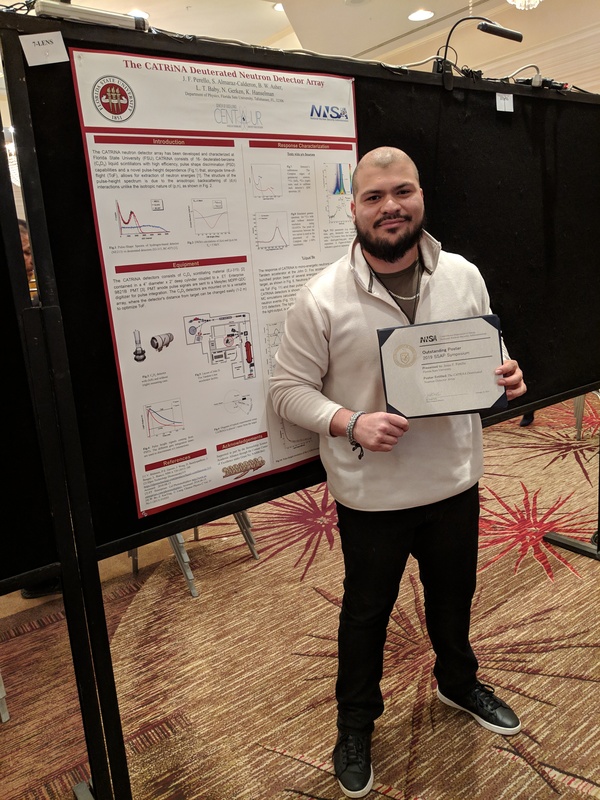 CENTAUR Graduate Student, Jesus Perello from Florida State University, received an Award for Outstanding Poster at the 2019 National Nuclear Security Administration Stewardship Science Academic Programs (SSAP) Symposium on Wednesday, February 20. Read more about this achievement here! NEW! Read what our first graduating student has to say about her experiences with CENTAUR and how it helped shape her career! “…the CENTAUR program came along and introduced me to the NNSA national laboratories, opening my eyes to the hidden world of mission-based science…..” Click here to read further! Information about the Department of Energy National Nuclear Security Administration Laboratory Residency Graduate Fellowship program for graduate students. Read the newsletter from Michigan State University about project milestones including accelerating beams in superconducting cryomodules and a successful circulation of liquid-lithium film at the Facility of Rare Isotope Beams (FRIB). 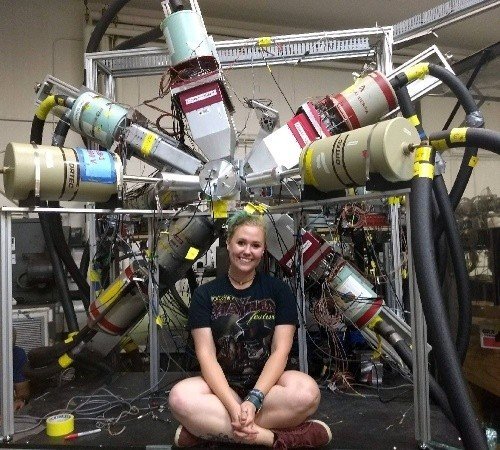 Read the article from the University of Notre Dame Department of Physics about how CENTAUR helped fund a graduate student’s summer at the Lawrence Livermore National Laboratory. Read the article from Washington University in St. Louis about CENTAUR chemists and physicists working to build a better computer chip for improved neutron detection and surveillance of illegal transport of nuclear materials in the U.S.
Information about the Neutron Detector Workshop 2018 has been posted. Read the press release from Texas A&M University College of Science announcing the establishment of CENTAUR. Visit our Opportunities page for information regarding hiring positions, programs and fellowships. Conduct basic research in low-energy nuclear science of relevance to the stockpile stewardship goals of NNSA. The proposed research encompasses experimental and theoretical aspects of low-energy nuclear science, with an emphasis on stewardship relevant topics. Graduate students will be recruited and trained via the proposed NNSA relevant topics. Create a partnership that allows for use of accelerators at Texas A&M and Florida State universities among other university partners and national laboratory collaborators. The Center will provide opportunity for: collaborative use of accelerators and other research equipment among Center university partners and National Laboratories, intellectual exchange between academic research partners and research scientists at the DOE/NNSA laboratories, and provide broad and appropriate training in low – energy nuclear science. Develop a workforce trained in the nuclear science relevant to support the DOE/NNSA laboratories. Center efforts will focus on the recruitment, education, and training of graduate students and postdoctoral scholars (post-docs) in research areas and techniques applicable to the workforce needs of the NNSA. The trained students and post-doctoral fellows will not simply be experts on one technology, but be able to evaluate competing strategies for approaching experimental and theoretical nuclear science problems. Many will have collaborated with staff and/or interned at Lawrence Livermore National Laboratory or Los Alamos National Laboratory. The Center for Excellence in Nuclear Training And University-based Research (CENTAUR) is a multi-institutional effort supported by a five-year, $10 million Stewardship Science Academic Alliances (SSAA) grant from the Department of Energy’s National Nuclear Security Administration (DOE/NNSA). CENTAUR will pursue basic research in low-energy nuclear science through experimental, theoretical, and technical programs using accelerators at Texas A&M’s Cyclotron Institute and Florida State University’s John D. Fox Superconducting Linear Accelerator Laboratory as well as facilities at the other participating institutions. Existing collaborations between scientists at Texas A&M and the NNSA national laboratories—including Los Alamos National Laboratory and Lawrence Livermore National Laboratory—will be incorporated into center programs and expanded to involve scientists from all partner institutions, which include Texas A&M University, Florida State University, Washington University in St. Louis, the University of Washington, Louisiana State University and the University of Notre Dame. To learn more about CENTAUR, from research programs and technical resources to available graduate student and postdoctoral funding, contact us.